New York City has a special relationship with cockroaches. Anyone who has lived here has dealt with these horrible little fiends, whether it's in a tiny studio apartment in a downtown walk up or in a palatial penthouse with a doorman in the lobby. There's even a famous hipster t-shirt featuring a dramatic showdown between cockroaches and rats for the soul of New York. They're just part of life in the big city. The red hot sparkling water brand LaCroix is very popular in New York and recently the brand was accused of containing a chemical also used in roach insecticide. This had many a New Yorker perking up their ears, us included. A lawsuit filed by Beaumont Costale charged that LaCroix includes "synthetic" ingredients like limonene, which the suit claims "can cause kidney toxicity and tumors," and has "linalool propionate, which is used to treat cancer; and linalool, which is used in cockroach insecticide." To its credit, LaCroix's parent National Beverage Company (NBC) wasted no time addressing and alleviating concerns and getting control of the message. Regardless of the results of any future legal decisions, this is a solid example of a company taking control of a negative message and not allowing opponents to dominate the discussion around their products. For those old enough, this is highly reminiscent of when Corona fought back publically against slanderous accusations in the pre-Internet 1980s that its beer brands were being debased at the brewery. And Corona seems to be doing just fine today. LaCroix got some help from popular media as well. The data crunching nerds at fivethirtyeight.com debunked the suit against the company in a terrific article called 'No, LaCroix Isn't Poisoning You Like You're a Giant Cockroach.' The conclusion of that article was that LaCroix is not accelerating your demise, rather in a world of ambiguous regulation, definitional issues remain a challenge for food additives and that the lawsuit was at best specious. However, this recent news reminded us of one thing: the sparkling water category is absolutely on fire and we doubt something as odd as a possibly frivolous lawsuit will derail it. Let's look at the DrinkTell™ numbers. First, the sparkling water segment itself is rocketing in a category, bottled water, which itself is outperforming. In this decade, bottled water grew from 17.9 billion gallons in 2011 to 26.4 billion gallons in 2017, growth at a CAGR of 6.7% according to Beverage Marketing's DrinkTell™ database. As we wrote in our recent article, "Juice: Lost in the Millennial Woods," bottled water continues to grow driven by availability and the evolving consumer rejection of calories in liquid refreshment beverages (LRBs). Per capita consumption has now risen to a dizzying 40.3 gallons per head, leaving former industry leader CSDs in the dust at 37.4 gallons. As for sparkling water, this decade has been a golden age within a larger golden age. Sparkling water (both domestic and imported) volume rose from 141 million gallons in 2011 to 421 million gallons in 2017, a CAGR of 20%. 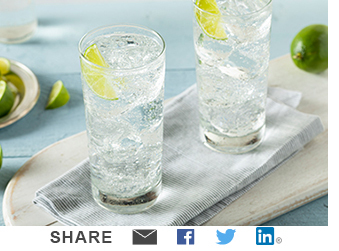 Although the traditional bottled water segment still dominates the category with 50% of volumes, sparkling water has jumped from 0.8% of bottled water in 2011 to 1.6% in 2017 according to Beverage Marketing's stats. Much of this success can be attributed to the growth of the aforementioned LaCroix brand. The old saying in Hollywood is that it takes a long time to become an overnight success and this certainly applies to LaCroix. The brand has been around since the early 1980s when G Heileman Brewery created it as a less pretentious answer to Perrier. The brands roots were deeply in the Midwest until it was sold to NBC in the early 1990s, which has since spread its distribution. The brand really found its wings when NBC chased Millennials with a social media campaign launched three years ago. The social media campaign hit the right notes and the result was that the brand was a hit. Volumes took off: LaCroix was 29.4 million gallons in 2014 but has since exploded to 111.6 million gallons in 2017 at a CAGR of 56%. The brand is by far the leader with 41% of the domestic sparkling segment. That's real brand strength, well managed by its owners. As a result, we expect this recent news of the lawsuit will be a tempest in a tea pot, soon forgotten. Perhaps the lesson in all of this is if you see something you don't like attacking your brand, step on it fast.